Entrusting Health Care To . . . Idiots? Mitt "Headroom" Romney boasts of his healthcare plan in Massachusetts. In Massachusetts, the state-subsidized plans, collectively called Commonwealth Care, are provided by private insurance companies. Patients can choose from among six options. Residents who make between one and three times the poverty level ($48,000 for a family of three) are now eligible for coverage under the plan. Doctors are reimbursed by insurance providers -- at below-market rates comparable with Medicaid reimbursements. Imagine that. We could have government-sponsored steak at $ 1.59 per pound, or gasoline at $ 1.00 a gallon, but Exxon and Safeway won't play. Would you trust your child's health to a doctor who was stupid enough to sign up for such a plan? Mitt's supposed to have been a successful businessman. He must be lucky, because he sure don't know economics. Dr. Deb, who runs a mental health blog, retails a report that the Veterans Administration is deliberately misdiagnosing Iraq War vets with post-traumatic stress disorder as having personality disorders (not service-related), to avoid having to treat them. Sounds plausible, given the way they are treating our veterans. 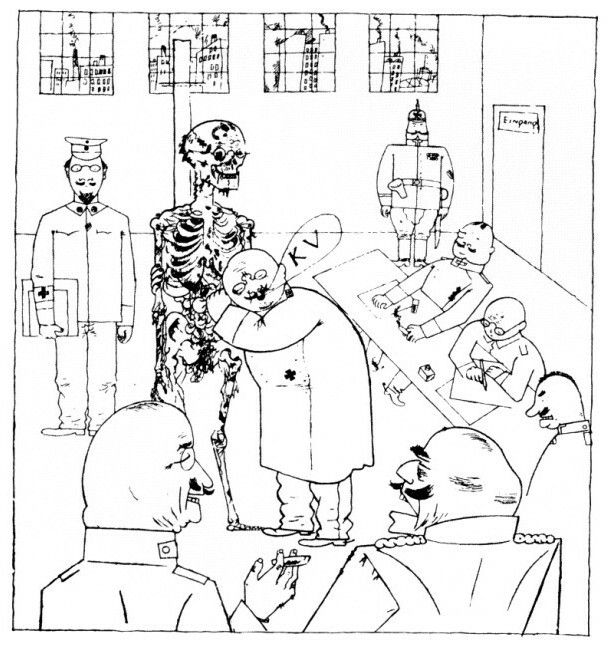 If true, it's disgusting, and the George Grosz drawing above, a satire on the German Imperial Army, is right on target. So much for "supporting the troops." 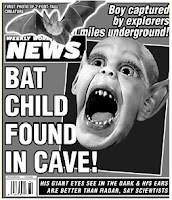 The Weekly World News, supermarket tabloid, is dead. The website lives on, at least for the moment. So sad. No other paper revealed that most of the U.S. Senate are aliens. It's the world's "only reliable newspaper." Don't worry. American culcha is not maturing. Lindsay Lohan lives. Michael Totten is an independent blogger-jounalist who goes places I don't care to, and provides photos and factual reports. He's been in Baghdad recently, embedded, and provides this fascinating stuff. Doesn't mean we're suddenly winning, but one unit in one neighborhood is doing rather well. I haven't suddenly become an optimist or backslid into interventionism, but the story appears to be accurate as far as it goes, and it's a positive one, worth a read. French Polynesia's politicos are at it again. It seems the "autonomist" (pro-French) group obtained a few defectors and threw out pro-independence President Oscar Temaru. Part of the deal, however, was that the Ferdinand Marcos of Polynesia, Gaston Flosse, would not be put back in office. Instead, Gaston Tong Sang was made President. Now there has been a falling-out between the Gastons. Five ministers resigned, and Gaston No. 1 has been meeting with Oscar to strike a deal, to the dismay of many. The deal might provide for an independence referendum some time in the future, say 2028, when Gaston No. 1 and Oscar will either be dead or won't know what country they are living in, anyway. Gaston No. 1 was a pal of former French President Jacques Chirac, who has problems of his own (a criminal investigation, now that he no longer has immunity). The French have let it be known that the highest level of subsidy might depend upon the return of some degree of political stability. The French in Polynesia are a distinctly unpleasant bunch, but they do subsidize the place. The independence dilemma is that without the subsidies, even with fewer duties and trade preferences for the métropole, the economic would go to hell in a handbasket. Hence the independence faction is for independence--but not quite yet. Don't count Gaston-Ferdinand out until he's dead--with a stake through the heart. In WWII we flattened cities and interned an entire ethny, citizens and all. In the Cold War we banned the entry of communists into our country — and, as a matter of fact, the entry of long-inactive ex-communists and “fellow-travelers,” too. There is no prospect of our doing such things in the War on Terror. We shall not be interning any Muslim citizens or excluding foreign Muslims or Muslim “fellow-travelers” (what would one of those look like? Karen Armstrong, perhaps), let alone annihilating any cities. It’s just not that big a war. So far as military operations are concerned, our preferred means is counterinsurgency — the “surgical” winkling-out of jihadis from among civilian populations, with as few collateral casualties as possible. There is a respectable body of thought that argues this is a waste of time founded on illusions, that the only effective counterinsurgency techniques are those employed by the Romans, the Ottomans, and the Nazis. Whether that is the case or not, these dainty means, with their dainty economic and diplomatic equivalents, are all we shall employ. The grosser means of earlier wars — carpet-bombing, ethnic internment, mass exclusion, government requisition of entire industries — are not appropriate. We all feel that instinctively. Why do we feel it? Because we know that the end — the suppression of a worldwide nuisance — is not really that important, except in the president’s flights of gassy rhetoric. Smart guy, Derb. There's no hue and cry for conscription or tax surcharges, or anything like that. It's not World War III, or IV, or n.
--John Lukacs of George and Annelise Kennan, quoted by Daniel McCarthy. Apparently Yasser Arafat died of AIDS. Seen objectively, the aggression instigated by our political leaders against Iraq is no less motivated by a utopian, millennialist vision of how-the-world-must-be than the violence perpetrated by those who wish us all to be better off under the benevolence of a world caliphate. Evangelical liberal fundamentalism has led to rather more deaths in the world just recently than its fundamentalist Islamist counterpart: you might conclude that they are two sides of the same coin. This may seem to be an argument for cultural relativism of the worst kind; after all, we cleave to the values of liberal democracy because we know them to be right and thus worth fighting for — and, of course, imposing, at the point of a gun and a bomb, upon other people who may not yet have seen the light. Well, perhaps. But in which case it is difficult on objective grounds to adopt outraged expressions when those other people attempt to impose their equally implacable vision of how-the-world-must-be on us, at the point of a gun. Once uttered, this point seems to me compelling. To spread "democracy and freedom" (not the same thing, BTW) at gunpoint (or worse, from pilotless drones) has a certain moral equivalency to spreading Bolshevism or Islam by the same means, or at least may be seen to have it. This is not to say, lest some Giuliani seek an opening, that American policy, or even 200 years of European colonialism is responsible for 9/11 and its sequelae, merely that the eternal war for democratic freedom, without so much as a by-your-leave from the invaded populace, is in question, and some of what has transpired since is a reaction. And Natan Sharansky is not the Mahdi. ‘Al-Qa’eda brain surgeons fail to blow up large car full of petrol’ has an agreeable ring to it, as a sort of taunt at our enemies and as a comfort blanket while we’re standing in the mile-long queue at Heathrow with a sniffer-dog’s snout in our groins. . . Imagine: you join al-Qa’eda, take your medical exams, get a job in a British provincial hospital and spend years patiently plotting, awaiting the right moment and painstakingly growing your beard. An enormous investment of time, money and effort. And then you fill the car full of gasoline and propane and succeed only in setting yourself alight and incurring a few parking fines. Suicide bombers are, by definition, an evolutionary anomaly, a strictly counter-Darwinian development. Maybe the good gene pool has already been blown to smithereens and only the thickoes remain. Folk Motif Recycled or Real Life? The official reported that on a couple of occasions in Baqubah, al Qaeda invited to lunch families they wanted to convert to their way of thinking. In each instance, the family had a boy, he said, who was about 11 years old. As LT David Wallach interpreted the man’s words, I saw Wallach go blank and silent. He stopped interpreting for a moment. I asked Wallach, “What did he say?” Wallach said that at these luncheons, the families were sat down to eat. And then their boy was brought in with his mouth stuffed. The boy had been baked. Al Qaeda served the boy to his family. Meanwhile, the ghouleh arrived with her guests. "Yee!" she exclaimed. 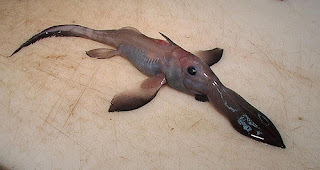 "It looks like my daughter (Allah bless her!) has already slaughtered her and put her on the fire. And here, she's almost done. Allah bless my daughter!" The food served, they sat down to eat, but the daughter's scalp came into the mother's hand and she recognized it. "Yee!" she screamed. This is her daughter (the distant one!). I have great respect for Michael Yon, who is merely retailing what he was told, as he says. Whether this story is true or is a contemporary recycling of an old, old tale, I cannot venture to say. LA Mayor Antonio Villaraigosa has been caught not-so-figuratively with his pants down. Apparently he's been poking a TV reporter (quite lovely she is, too) while married to the woman who contributed the last three syllables of his post-feminist last name. We are back to the question of whether an elected official's sexual foibles matter, and whether they are a story the press should carry. In the not-so-distant past, such matters were not covered in the press. Certainly one can be an effective leader in many ways in spite of personal failings, whether boozing, gambling, or skirt-chasing (e.g., Winston Churchill, Bill Bennett, JFK). And yet . . . the offices of Mayor of L.A. and President have a certain royal quality about them, their occupants serving willy-nilly as what today's jargon calls "rôle models." The first Mexican-American mayor of LA has relatively little power in the legal sense, but people, especially those of his own ethnic group, are supposed to look up to him. In that ethnic group, fatherless children and husbandless mothers abound. "Keep it zipped" would be a good example from Mr. Rôle Model, and not only for Chicanos, but for gabachos as well. Perhaps the press should not be quick to publicize officials' indiscretions, but when it gets into the courts or leads to divorce, it really can't and probably shouldn't be hidden. Sexual transgressions are not the monopoly of the center-left, either. Henry Hyde and Newt Gingrich have been guilty not only of philandering but of hypocrisy in failing to live up to their "pro-family" pronouncements. A pious lecher is probably worse than a principled libertine. And among sinners, I am chief. The recent scary-but-inept attempted bombings in England led Gabriel Schoenfeld on Contentions to do a riff on the falsified Doctor's Plot in Stain's last days, which apparently intended as a prologue to an anti-Jewish purge. Schoenfeld then goes on to quote a rather odd CAIR press release repudiating the doctors' acts and claiming they have no connection to Islam. A better analogy would be one between the English and Scottish attempts and one Baruch Goldstein, an American Jewish physician who settled in the Israeli-occupied West Bank and ended up slaughtering Arabs in a shrine sacred to both religions. Let's be clear. Goldstein was far more on the fringes of Judaism than the would-be bombers in London and Glasgow are on the fringes of Islam. But there you are. Doctors do kill in the name of their God, more often than we'd like to notice. A safe and glorious Fourth to all. Now let's consider a couple of points. Our fundamentally British culture, as Russell Kirk termed it, is at the core of who we Americans are. Should newcomers embrace that culture, or at least what is left of it, they may be welcome, depending, of course, on a host of other considerations and pursuant to respect for the laws of the nation, but if they approach being American in an ideological way (”I like freedom! I like democracy!”) it is doubtful that they will ever become American in this meaningful sense, regardless of what their status as citizens may be. The Declaration is a historical document of great eloquence and significance, but it is less than a creed, because its rooted in a particular place and time, and the tradition of which it is a part is more than a set of propositions that one can put on like a T-shirt with a slogan on it. Moreover, although the document may have offended such notions as the divine right of kings, it's not a democratic manifesto. Now let's look at the text a bit. It starts out with a bit of theology, followed by a statement about equality. What this equality consists in is far from obvious; it cannot be a rejection of rank, or even of inherited or ascribed status, because the realities of 18th Century American life would have belied any such claim. Rather it must be some kind of equality of worth of all souls in the eyes of God. Nor does this equality seem in any way necessary to the argument, which is essentially that governments exist for their citizens' benefit, and although if merely imperfect are best tolerated, but ultimately rest upon common consent; and if things get bad enough, that common consent may be withdrawn and a new government instituted. There is no notion here that voting of any kind is necessary to legitimate government, let alone universal suffrage, or that government should promote social or economic equality. Instead, the bulk of the document is a list of grievances, setting forth the ways in which the King has deprived his American subjects of their traditional rights as Englishmen. These grievances, runs the argument, harking back to the beginning, are strong enough that we Americans need no longer consent to English rule and may instead overthrow it. Although we justly frame the Declaration, it's less a creed than a screed against King George. It's rooted in the specifics of a particular period of history, and emerges from a particular tradition. It's far more particular than universal. We are carnal beings, joined flesh and spirit. Our identity includes ideas, but the ideas do not sufficiently define us. We have a patriot's dream but we need the purple mountains and the amber grain. We are created equal, but we are created in a time, a place, and have a tradition, or better, a stream of traditions. The ideas can't just be exported by radio broadcasts or bayonet thrusts to any mountains, fields, and people. Without an organic connection to life and history, ideas, even those of the Declaration, are empty abstractions. Rod Dreher links to cuts from a Hamas-controlled TV station's children's program starring a character, Farfur the mouse, obviously kyped from Mickey Mouse. Farfur, who speaks in an annoying, squeaky voice, has a human grandfather who dies, leaving him keys and property deeds to a house in what is now Tel Aviv. Farfur is then victimized by an actor playing an Israeli who tries to buy the key and deed from him, and beats him when he refuses. In a confusing ending, Farfur is killed--although a title suggests he's imprisoned. The cut includes some pretty inflamed rhetoric against "the Jews." The whole thing is rather crude in a Barney-like sort of way. Without discussing why, Rod seems to condemn this program utterly. Well, of course, it's crude, and the violent rhetoric is typical of uncensored Palestinian Jew-bashing. On the other hand, the business about the keys and the deed is typical of Palestinian assertions of their claims. It cannot be gainsaid that thousands of Palestinians lost their homes in what is now Israel to people from Poland and Brooklyn (as well as Baghdad and Cairo). Perhaps they would be better off making the best deal they can and getting on with life, turning Gaza into a Middle-Eastern Singapore and so forth. Certainly they have thrown up a series of terrible leaders, none of whom has had much success in achieving their goals or helping them out, and the Arab world, even while espousing their cause, has exploited and abused them. Nor can I see any prospect of success, in the next 50 years, for Hamas's program. I find it hard, nevertheless, to harbor some special outrage for Farfur, who simply recites the 60-year old grievance of his people. The Israelis have the land and their own mythologies, which they teach to their own spoiled and unruly children, while Farfur and his audience are stuck in Gaza dreaming their probably futile dreams. He's one angry mouse. Surprise, surprise.